Hi there, Adventuresses and Adventurers! Let me start this update by sending so much love to our friends in New Zealand in the aftermath of the terrorist attack in Christchurch this last week. Our hearts are with you during this terrible time. It’s just over 4 months to con, and we’re trying not to think too hard about that - there’s so much to do! 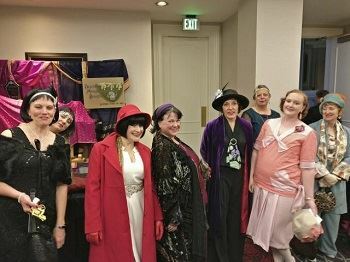 We have confirmed the sessions that’ll be presented and the majority of the vendors who’ll be there; the Saturday night event, The Curse of the Black Scarab murder mystery, is open to registration by con attendees; and folks are already talking about what they’ll wear and what they’ll do in the days before and after. It’s not too late to join us in San Jose if you’re not already registered - we hope to see you there! 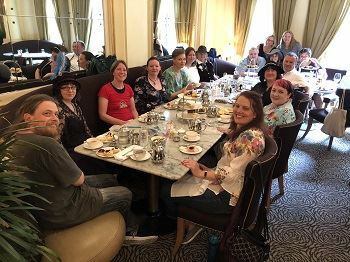 Top: A group of 2018 con attendees organized a high tea for the day after con. Bottom: 2018 con attendees in their finery. We love to hear from fans about what’s going on in their lives when it comes to fandom! If you’re planning a local meetup, we’d love to help you promote if via our Facebook events listing, and don’t forget that with membership comes access to a private Slack chat room that’s great for getting to know other fans before you meet them in person, at con or otherwise. True fact: The founding members of the ACotA board met initially via Slack, and look where it’s taken us! Some of my best friends are ones I made online through the Miss Fisher fandom. Flat Phryne is still winging her way across the globe. You can follow her adventures on our Instagram; we’re tagging them all with the #flatphryne hashtag, and since she’s sampling the worlds of our Adventuresses, you don’t want to miss a post! Where will she end up next? If you do get to see it, we’ve set up a MOD channel in the ACotA Slack where you can talk about it with others who’ve watched, without worrying about spoilers. Come join the discussion!